Being graphic designers make us always strive for something fresh and new. One of the most important steps on the wedding planning process is designing the invites. It marks the beginning of the planning and it’s the first impression that your guests will get from your wedding. On that point, you already will have a moodboard and concept settled for the styling. We love moodboarding because it allows us to dream and explore new ideas, colours, textures, materials and approaches not so convencional which can set a different and unique vibe for the wedding day. So you want that your invitation reflects the same style but in a graphic approach. 1. Look for inspiration on places that you are not counting on. Don’t follow your friends wedding’s trends. Think about your personality and build inputs for the wedding. Sometimes a colour or a typography is everything we need to start the design! Think outside of the box and be bold. 2. You don’t need to use every piece of your wedding concept and colours on the invitation. Let it breath and be clever, your wedding invitation should be a part of the wedding (and not represent the whole thing on just a small piece of paper). If not, it will be to much. The graphic materials should complement the style. 3. Unless you are looking for having something very complete and graphical, don’t waste your wedding budget on over the top finishes with hand made illustrations and thousands of details. Less is more, and if your budget if tight, use it the best way possible. Sometimes only a card with a nice foil and a envelope is all you need. Couples tend to spend more at the beginning and forget to save for important stuff along the way. Printing can get very expensive so be wise with it. 4. Be aware of the market and, if you are ordering the work, make sure you work with graphic designers. People that doesn’t do it by profession will not be as much capable of creating something unique and outside of the box, as vendors that have the expertise on the field. 5. Trust on the vendor you hired. Your sight gets so addicted on what you saw before that you are putting much expectation on the final result. Usually, as much reviews as you do to the artwork, the worst and not so true to your wedding the invitations will get. Don’t forget that everything is made having your tastes and wedding style in mind. Be open minded! 6. Finally, be bold. Your invitation doesn’t have to feel as a representation of a wedding. It can be more corporate and less romantic, it can shock by a colour or layout, it can have a crazy geometric pattern or be really simple and the cotton paper breaths so well. 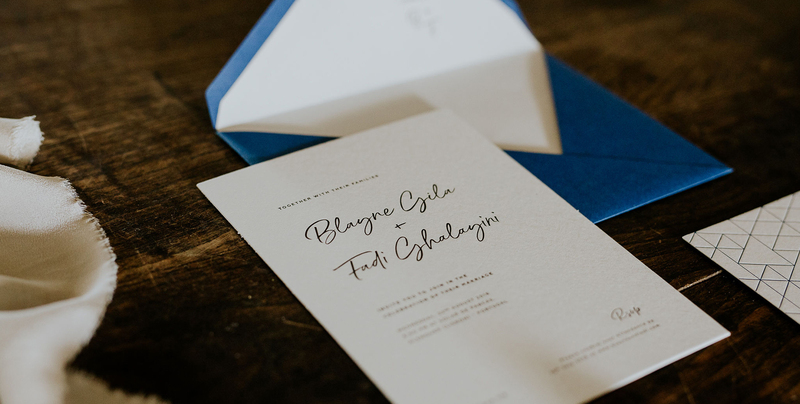 Even for the romantics, you can represent it with a colour of a paper, with the way you close the invites or even just with the copy. The important thing is making a bridge between every topic of the wedding. Don’t overthink it too much, be spontaneous! Here you have some inspirations of wedding invitations we love! We hope you like them too!